With the increased movement of humans to coastal areas and the industrial, developmental and recreational activity that has followed, the use of coastal beaches by wintering and migrating birds has appeared to decline. Different species of bird can be affected by human-related disturbances depending on the type, scope and duration of the disturbance. Disturbances interfere with the foraging efficiencies of birds by forcing greater numbers into less profitable foraging sites, making them expend energy to avoid molestation or by decreasing the numbers or availability of prey species. Indirectly, the temporary presence of humans at foraging sites can make an area inhospitable to foraging. The concentrations and distributions of birds on relatively disturbed (public access) and undisturbed (military base) coastal beaches in southeastern Virginia was compared during the winter and spring of 1992. Total birds, gulls and terns, and Ring-billed Gulls were more common during the early half of the study and disturbances were more common during the later half. Shorebirds showed no such seasonal differences. 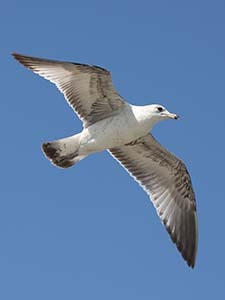 Total birds, gulls and terns, shorebirds and Ring-billed Gulls were more common at low human-use beaches. Disturbances were more common at high human-use beaches. Within beaches at different resolutions, the mean numbers of birds when alone and when in conjunction with disturbances was statistically the same although all categories of birds appeared to avoid segments of beach with disturbances. At 100 and 200 meter segments of the beach, all categories of birds significantly overuse segments of beach with the fewest numbers of disturbances present. Ring-billed Gulls show this same pattern of overuse at 300 meter segments and shorebirds show the same pattern at both 300 and 600 meter segments. In addition to the stresses of environmental conditions such as temperature, tidal and wind factors, birds can be adversely impacted by the presence and activity of humans on coastal beaches. Protected lands along coastlines should be monitored and managed for wintering and migrant species. Major coastal staging areas, considered especially critical for migrant species, should continue to be protected.